DETROIT — Jimmy Howard was in fine form Tuesday night, and it helped propel Detroit to its second win in a row and third-straight with at least one point – this one a 2-1 decision over the Anaheim Ducks. It couldn’t have been more fitting for Howard, as he also passed Tim Thomas for eighth all-time in wins by a U.S.-born goaltender with his 215th. 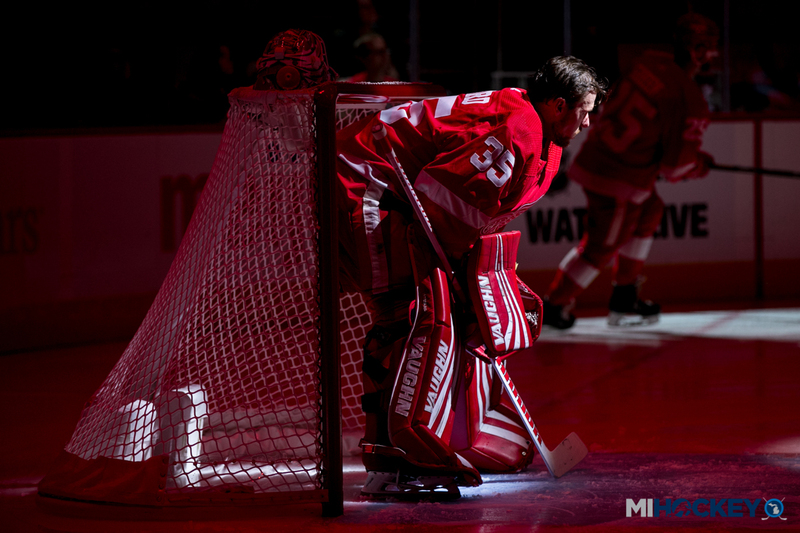 He earned high praise from head coach Jeff Blashill, a former goalie in his own right. Howard credited his teammates, both past and present, for helping him reach the mark. Meanwhile, Dylan Larkin and Frans Nielsen provided the offense for the Wings. Larkin opened the scoring with his ninth of the season at13:32 of the opening frame. After Ducks defenseman Kevin Bieksa shipped a pass right in front of the Ducks’ goal from behind the goal line, Larkin intercepted and beat netminder John Gibson with a backhand move. Just past the game’s halfway mark, the Ducks were heavily outshooting the Wings, 20-6, but it was Howard who held the fort down to the best of his ability, and his teammates certainly recognized it. With just over four minutes left in the middle frame, Nielsen gave the Wings an insurance goal off a no-look centering pass from Anthony Mantha. The goal marked just the Wings’ ninth shot of the game at that juncture. Adam Henrique cut the Wings’ lead to one with just over four minutes left in the contest, as he banged home the rebound of a Kevin Bieksa shot. Howard stopped the initial shot, but the rebound popped up in the air and dropped down behind him, as it sat on the goal line before crossing the line. That’s a goal Howard’s teammates wish they could’ve kept out to get him his first shutout of the season. The Wings next head to Tampa to take on the Lightning Thursday night.